While editing this evening, I had my iChat (Mac instant messaging) window open. I'm listed on a couple of Mac sites as a contact for people who want to try out text, audio, and video iChatting. So I wasn't surprised when I was called into chat by an unfamilar person. I quickly Googled his (her?) mac.com email address (which is also an iChat buddy name), and was taken to a translation of a Chinese site. It appeared that he (she?) was from Hangzhou, China, so I quickly began to look up info on Hangzhou (in Eastern China). Meanwhile, my new buddy asked where I was, and what time it was there. It turned out he had never heard of Seattle. While I explained that it's between Vancouver, BC, and San Francisco, he reported he'd spotted it using Google Earth. I opened my copy of Google Earth and was soon looking at satellite images of the enormous apartment buildings in Hangzhou (it's one of the largest cities in China). Some quick Google searches revealed that Hangzhou is renowned for its traditional green tea, called Longjing. Longjing is picked by hand and pan fried (rather than steamed). I mentioned this, and quickly copied and pasted in the characters for it: 龙井. Then I added that I like Lapsang Souchong, a highly fermented black tea (正山小种 or 烟小种), and Yunnan tea. 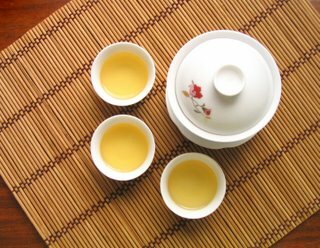 My buddy explained that black teas like Yunnan are rarely consumed in central and eastern China, where green tea is preferred. Then he apologized for his "bad English." Good grief, I can't even type in Chinese much less communicate in it! Anyway, it was great fun -- and pretty much typical of the encounters I have with folks I meet in the Mac online communities.